There are many benefits of play-based learning in the early years, including the development of intellectual skills, thinking and motivation. Play-based learning is a concept that many early years educators adopt as part of their pedagogy and practice. Research has explored the importance of play for a child’s overall development and we know that play is closely associated with the development of intellectual skills, thinking and motivation. The Early Years Learning Framework defines play-based learning as ‘a context for learning through which children organise and make sense of their social worlds, as they engage actively with people, objects and representations’. Children may engage in play on their own and explore different materials. They may also play with each other and use materials to represent other objects. This type of play, known as symbolic play, holds great value in developing cognitive skills, imagination and social competence. Here are four ways play-based learning benefits children in the early years. Engaging in active play from an early age encourages the development of language skills. During pre-school years, a child’s vocabulary grows and develops as they play together with peers and interact with adults. Adults have the opportunity to support language development through play; they can do this by asking questions, encouraging conversation and introducing unfamiliar words. The context of play allows for this to happen in a natural way and learning is amplified as it is enjoyable and relevant to the child’s interests. Participating in play that involves music and rhyme supports the development of pre-literacy skills, such as listening skills and sound recognition. Activities such as singing songs and reciting rhymes play a big part in laying the foundations for reading and basic literacy. Rhyme, rhythm and repetition help children to develop their memorisation skills and their ability to differentiate sounds. Engagement in play is closely associated with the development of social and emotional skills. Playing cooperative games and circle games brings joy as children share these social experiences with friends. It also plays an important pedagogical role of developing a sense of belonging to a community. Without the feeling of connectedness, children will not be able to engage in learning. The ability to develop positive relationships has also been linked to play-based learning. As children play with each other they learn to get along with one another, use words to communicate their needs, cooperate and resolve conflicts. Emotional competence and empathy are developed through play as children learn about the feelings, emotions and motivations of others. It is essential to provide opportunities for young children to engage in dramatised play to demonstrate ways of caring and showing empathy. Examples of dramatised play include cuddling their teddy bear when the teddy is ‘hurt’ and feeding their dolly when the dolly is ‘hungry’. Playing is also a known stress release and children can engage in calm play when the day becomes ‘too much’ for them. Calm play can be therapeutic and allows time for the brain to process information and recharge. Research has linked play to fostering creativity and imagination, valued traits that are vital in the modern world. Using imagination, children are able to find solutions to a variety of problems they encounter. Fostering imagination in its ‘natural habitat’ of play at an early age is fundamental to developing curiosity and raising a generation of creative problem-solvers. It is important to remember that play needs to be freely chosen and bring enjoyment to children. Learning through play creates a brain that has increased ‘flexibility and improved potential for learning in later life.’ Play-based learning is widely seen as an essential tool for early years teaching and learning as it greatly benefits children in developing essential life skills. 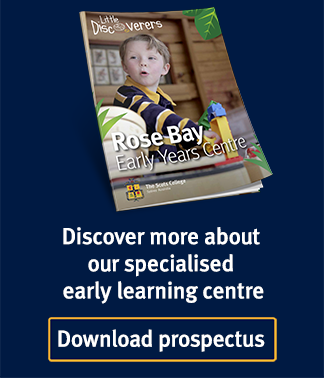 Learn more about The Scots College Early Years Centre by downloading our Prospectus. Arina is the Early Years Centre Coordinator at The Scots College. The EYC offers long day care for three and four year olds.